If you are an Acupuncture Alternatives patient you already know I encourage exercise and getting out in the fresh air whenever possible. Doing whatever exercise is suitable for a person’s body and physical needs is an important thing for everyone’s ongoing health. I try and practice what I tell my patients to do, whenever it is possible and appropriate. That all said, I thought I’d would share with you that this summer, Kyle and I, along with some friends, decided to join in the fun at RAGBRAI. What is RAGBRAI you ask? RAGBRAI stands for ‘Registers Annual Great Bike Ride Across Iowa’. This year the event took place July 23rd-29th, 2017. This summer was the 45th year for the event. RAGBRAI is a bicycle ‘ride’, not a race. Don’t let the word ‘ride’ fool anyone — the RAGBRAI is a physically challenging exercise experience for sure! There were times I wondered what on earth I had gotten myself into?! The RAGBRAI event was started in 1973 as a six (6)-day bike ride across the state of Iowa by two (2) Des Moines Register columnists who invited a few friends along. The event is always held the last full week in July. The RAGBRAI event is planned and coordinated by The Des Moines Register, the local area newspaper. The RAGBRAI route averages 468 miles and is not necessarily on flat terrain. The ride always begins somewhere along Iowa’s western border on the Missouri River and ends along the eastern border on the Mississippi River. To make things a bit more interesting for ‘regular/annual riders’ the route changes at least a little bit each year. 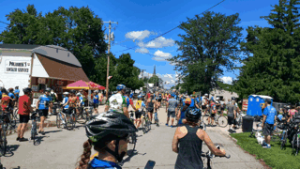 The ‘overnight towns’, where riders can most easily find food, lodging and camp sites are announced in late January each year by the RAGBRAI Route Announcement Party, in The Des Moines Register and on their website. Eight (8) Iowa communities along the RAGBRAI route serve as “host” communities for overnight stays. The RAGBRAI event is something that a person has to plan well in advance. It is limited to 8,500 week-long riders and 1,500 day riders. Also physical training and working to build up endurance and stamina prior to the event is an very important thing – it is a long ride! 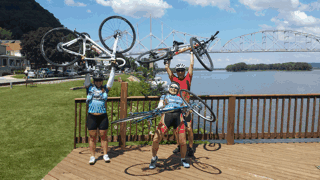 In our own little group who participated in RAGBRAI this year, a very good time was had by all! Definitely it was a tiring event for sure, but good fun for everyone, and no broken bones (not in our little group anyway) ! It was nice to be able to take a bit of time away from the office this summer, to get outside, enjoy the fresh air and sunshine with family and friends, and get some great exercise! Getting involved with a week-long bike ride might not be everyone’s ‘cup of tea’ as to how they want /or are able to exercise — but whatever physical activity works for you — as the commercial says — ‘just do it’! Get moving and exercise and do whatever level of exercise is appropriate for your schedule and physical needs. Most important – do what you need to do in order to stay healthy! Hope you were able to do some fun event this summer. Let me know how your summer was for you when you are in for your next Acupuncture appointment.